Keeping in tune with the last two weeks, mortgage rates have continued their steady climb into the third consecutive week of increases. 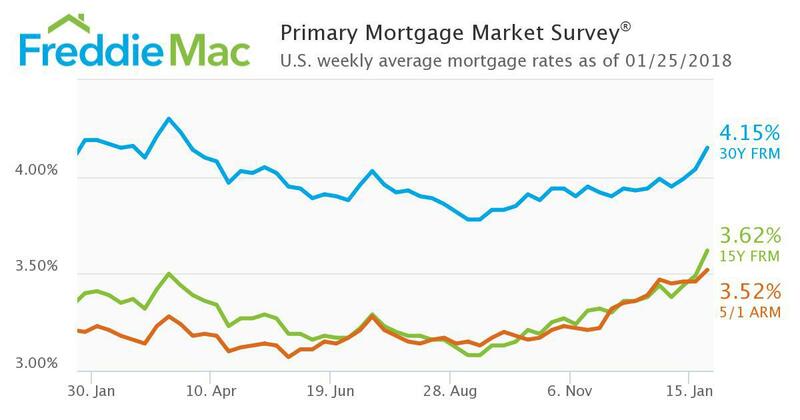 The Freddie Mac Primary Mortgage Market Survey (PMMS) showed the average 30-year fixed mortgage rate rising to 4.15 percent — 11 basis points up from the 4.04 percent seen last week. Last week was the first time interest rates reached 4 percent since July 2017, and it appears they’ll only keep inching up. Kiefer said existing-home sales data showed that 2017 was the best year for home sales in over 10 years, and he — like everyone else in the industry — is wondering whether 2018 will be even better. NAR chief economist Lawrence Yun and Keller Williams chief economist Ruben Gonzalez both believe 2018 will shape up to be a strong year for home sales as well, despite continued inventory issues. “Overall, we look forward to 2018 being another strong year for home sales, likely similar in magnitude to the previous two years,” he concluded.